Colder temperatures and snow are what every skier hopes for, and now that we've got both it's time to plan for this season's Pennsylvania Nordic Championship. This year PACCSA is trying something new: we're holding The Race at Wilderness Lodge in Wattsburg, PA. Wilderness bills itself as Pennsylvania's first ski touring center, and with typically ample snowfall managed by new state-of-the-art grooming equipment it's the ideal place for staging our race. 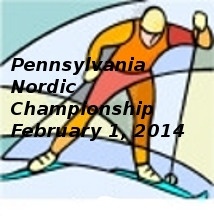 So mark your calendar and join us on Saturday, February 1, for a fun day of nordic ski racing, starting at 10 am. There will be a 5.5 km classic race, 8.5 km and 17 km skate races, and three events for children. And if you haven't left everything out on the trail, you can stay and ski until closing. What better way to top off the winter! Please register online, today. Online registration will close on Friday. Late registration will be from 8am - 10am Saturday morning at Wilderness Lodge, Wildcat HQ. There will be a late fee of $10 added to each race fee. The number of racers will be capped at 100 adults + 100 kids, so to reserve your bib number, register online. Bib pickup will be from 8am - 11.30 am Saturday at Wilderness Lodge, Wildcat HQ. The entrance is behind the trail fee building, which is the smaller building to the left of the main lodge. As you enter the parking lot, it is straight ahead. 10.25 Kids assemble outside the Wildcat HQ. 10.30 Kids leave for start locations, skiing in a group led by Wildcats Coach Ned. 12.00 8.5k and 17k skate. 2.00 Kids activities start, meet outside Wildcat HQ. Race fees online are $8 for the kids races, $40 for one adult race, $55 for two adult races (same racer). These include the trail fee for the day. Late fees for on-site registrations are $10 more for each race. Course maps for the skate races are at http://thewildernesslodge.net/conditions/ The 5.5k classic race is two laps around North and South fields. The kids races are along shorter sections of the classic race course, finishing near the Lodge. There are prizes and awards for overall winners and age group categories. For the adult racers, there are long-sleeved tech shirts for the first 50 to register, and fruit courtesy of Whole Foods Market.